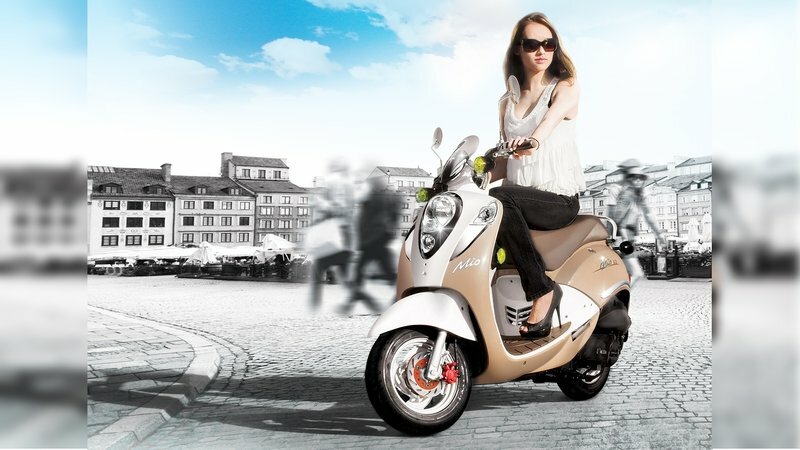 The Sanyang Motor Company expands its U.S. footprint with the Mio 50 scooter line. 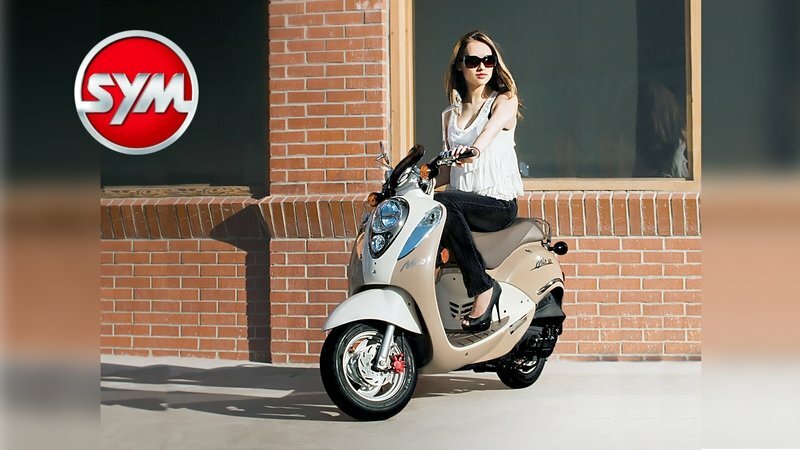 A compact learner’s ride, the Mio brings urban mobility and enviable gas mileage to the table along with an attractive modern interpretation of the classic Italian scooter design elements. 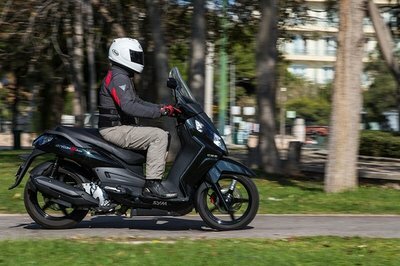 It comes restricted to 30 mph, so you won’t be hitting the highway, but if you need to zip across campus or around scooter-friendly urban areas, the Mio will fit the bill well enough with an affordable price and economically-minded 50 cc engine. Continue reading for my review of the SYM Mio. Visually, the Mio is a mixed bag. It presents a fresh face to the world with recessed marker lights and dual forward lighting. The prevalent curliness sets in right up front in the cut of the front fender. In profile, the leg guard has a pronounced elliptical shape with a graceful curvature that fits with the rest of the panache, but then the factory ruins it somewhat with some afterthought-class side reflectors. Just sayin’ guys, but maybe a set of fork-slider reflectors would have been better instead. Up top, a compact pair of round mirrors join the vestigial flyscreen to define the leading lines, but that little screen isn’t likely to protect anything beyond the twin-clock instrument panel that follows immediately behind. The cluster consists of an overly optimistic, analog speedometer that goes up to 50 mph with a fuel gauge, turn-signal indicator and oil-pressure idiot light. I’m sure I’m in minority now, but my ol’lady eyes do like the sweep gauges since they’re easier to take in at a glance and don’t get lost in bright light like the LCD displays can. A clean inner fairing yields to the complete step-through for my favorite ’tween-feet storage spot, and dead-easy mounting for the 29.9-inch high saddle. In a departure from the norm, SYM placed the fuel filler neither in the fairing nor the under-seat compartment, but instead located it in the tail with a one-touch, swing-away filler cap meant to keep your hands clean during refueling. A chrome grabrail around the rear of the p-pad gives the passenger a place to hang on, and it can serve as an anchor for a bungee net for a little more non-dry storage. Standoff, bullet-housing turn signals join the pentagonal tail light and tagholder to finish out the sweeping curve of the rear body panels. The arc of this sweep is probably the most dramatic design component, and that detail, however small, makes a huge difference in the overall look. 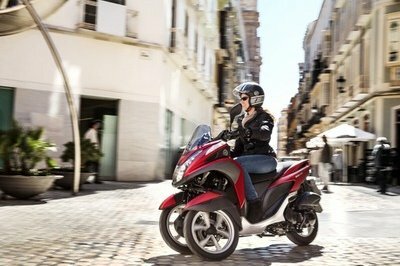 It’s not exactly a knockoff scoot, but fans of Italian-made rides will find a number of familiar features on the Mio. SYM stayed away from the monocoque-style structure, and instead used a tubular-steel underframe to support the ride. Hydraulically-dampened, telescopic front forks float the front end with a typical, unit-swing drivtrain and monoshock in back, and that pushes the 10-inch wheels out to 46.45-inches long at the axles. Aluminum rims round out the rolling chassis, and while I’d usually tout the benefits of keeping unsprung weight low, this ride simply doesn’t go fast enough for that to be much of a factor. Weight capacity is light at only 242 pounds, so if you plan on carrying a passenger, you’d both better be watching your weight. At least the 1.27-gallon fuel capacity won’t gobble up much of that when laden with a full load of fuel. A hydaulic caliper bites the single 160 mm front disc, but SYM relies on an old-fashioned, 95 mm, mechanical drum to slow the rear, and keeps things simple with no ABS or linked brakes to clutter up the works. The beating heart is a 49 cc, air-cooled thumper. It runs a moderately hot, 12.6-to-1 compression ratio, and yes, that premium fuel is going to cut into the operational economy just a bit, but at around 100 mpg, you shouldn’t need to fill it up very often. Power output is mild with a claimed 1.9 horsepower at 8,000 rpm, and 2.15 pound-feet of torque at 6,500 rpm. 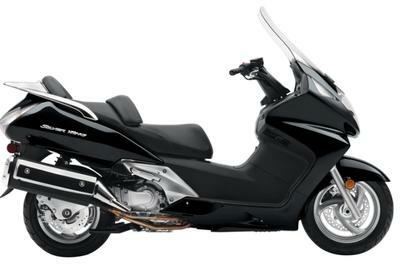 If that seems low, just bear in mind that this thing comes governed for a 30 mph top speed and is pretty much a Euro-trainer scoot, so don’t expect too much out of it and you won’t be disappointed. A dry, centrifugal clutch works with the continuously-variable transmission to provide seamless, twist-and-go operation with a quiet, belt-type final drive to put the power to the pavement. This is a very basic engine yet it still manages to meet EPA, DOT and CARB specifications with an outstanding mileage rating to boot. The only real technological star to be found here is within the cylinder where SYM’s Ni/SiC ceramic cylinder coating replaces the old heavy cast-iron liner with something that wears longer and conducts heat better. It’s not much, but there it is. The sticker has got to be one of the biggest selling points here. 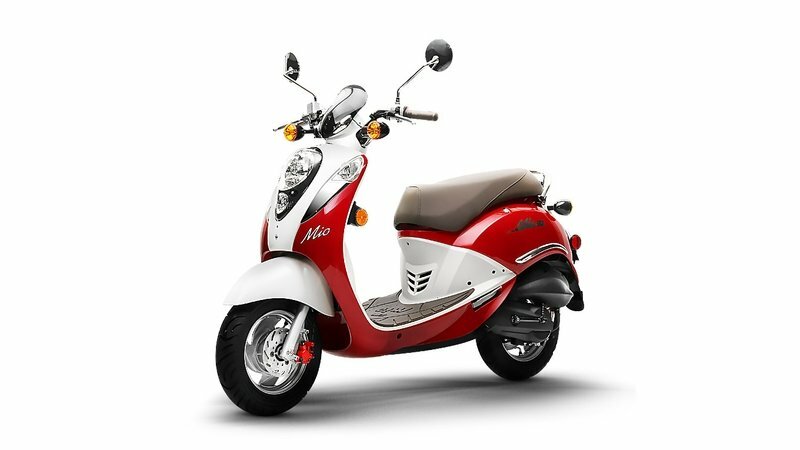 At only $1,999, the Mio 50 is quite the affordable bargain if all you need is basic transportation. It can be had in a half-dozen colors to include white and Midnight black, as well as the two-tone Chili-Red/white, Hot Chocolate/white, Latte/white and my favorite, the Burnt Orange/white. All Mios come with a 24-month, unlimited-mile warranty. It’s always fun to see how these lesser-known brands (in the U.S. anyway) match up against the popular household brands, so I played the Vespa card here, and went with the Primavera 50. Visually, each brings something all its own to the table. 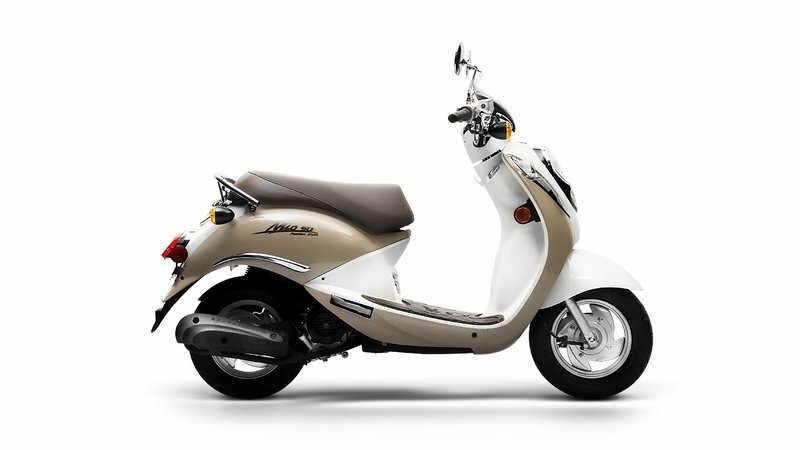 For the Vespa, this would be the unmistakeable, old-world vibe that starts with the handlebar/headlamp housing that cleans up the front end and the tapered rear panels that define the wasp-tail rear end. The Mio has a nice swoop in the bottom edge of its rear panels, and that gives it a charm that the straight-edged Primavera misses out on, but it really comes down to taste at the end of the day. I gotta say that I do prefer the full step-through of the Mio to the tunnel that interrupts the deck on the Vespa. Piaggio likes their trailing-link front ends that uses a coil-over shock to tame the motion of the single-sided front end. Too bad I don’t. Yeah, I’m sure it’s safe enough and all, but I consider any kind of feature like that to be a vanity. Give me the old tube-and-slider suspension like the Mio any day. 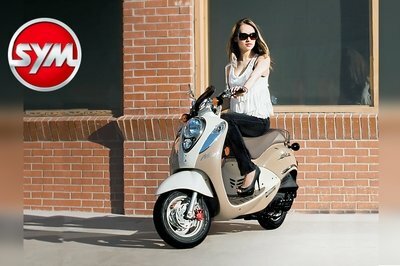 Vespa packs in more fuel capacity with a 1.6-gallon tank, only one-third of a gallon difference but there it is. The Primavera brings more brakeage with a 200 mm hydraulic disc up front and a 140 mm mechanical drum in back, but it uses a stressed-skin, monocoque assembly of which I have never been a fan. Give me a tubular-steel underframe like the Mio uses anyday. Thumpers rule the day, and the two mill are within a single cc of one another with the Vespa coming out ahead at 49.9 cc. The unfettered Primavera cranks out 4.6 horsepower and 2.8 pounds of torque for a top speed of 40 mph, and a more thrilling ride coming out of the hole. In spite of the greater speed and power, the Primavera manages to turn in impressive economy numbers with 96.8 mpg— almost as high as the Mio’s metrics. Of course, any love affair with a Piaggio product is liable to cool at the checkout counter, and so it is with the Primavera 50. 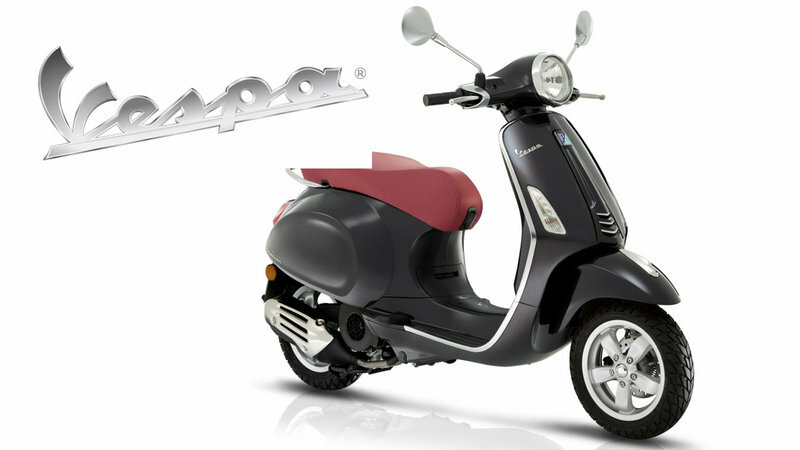 At $3,799, the Vespa product is almost twice the price of the Mio. 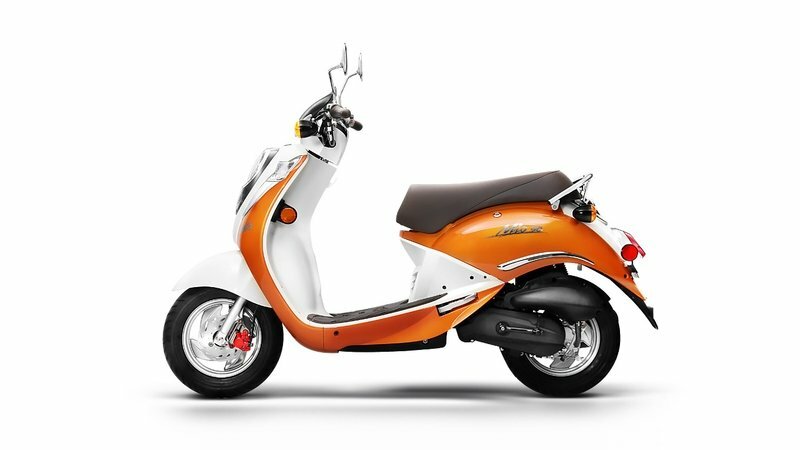 If a 50 cc scooter is your destination, the Vespa is probably the way to go, but if this is a transitional ride that will get replaced by something bigger in the foreseeable future, the Mio is a good deal. "My husband, bless his heart, hasn’t spent much time in urban areas where a scooter would be the answer to commuting and errand-running prayers. This Mio was a fun adventure,though only the 50 cc version is available in the U.S. market. It’s a slick little scooter with an affordable price."